In my previous post, I asked you to consider the case of Cesar Fierro and to deliberate via the comments. I was surprised as I prepared the post at how weak the case against Fierro actually was. An eyewitness and a confession should present a formidable case, and the jury clearly voted unanimously to convict, but I was nonetheless surprised at how lame the State's case was. Still, I tried to present the case as fairly and objectively as I reasonably could. I wasn't surprised by the pro-defense comments from the Skeptical Readers. I repeat them below. Just from that evidence, pretty clearly not guilty. Confession made under dubious-at-best circumstances, quite probably with threats to his parents, no physical evidence tying him to the crime scene, and only one witness who sounds like his statement could plausibly have been part of a plea bargain. When you say he turned and was shot, do you mean he turned the car or his head? Its hard to shoot someone in the back of the head if they are facing you. I vote not guilty. Does he have an alibi - yes, based on his landlord's testimony Is the prosecution's witness compromised? Think so, based on his bragging about how the police treated him. What is his motivation for testifying against Fierro anyway? Coerced confession - his mother and father's testimony as to their arrest is convincing and Fierro's mentioning his parent's were innocent in his confession seems telling. I cannot understand why the Defense did not demand testing on the items of clothing? It really should be impossible to sentence someone to death based on a witness with everything to lose followed by a confession which was likely coerced. Your previous post did a lot to highlight the startling problems that exist with police-obtained confessions, and here you present the perfect case to illustrate it. There is no evidence to speak of here that is above manipulation by otherwise interested parties - interested in getting themselves off the hook or interested in closing a case and making numbers on the board. No way, on the evidence presented in your post, that this one should be a conviction. Insightful comments one and all. I have some observations not mentioned by any of those who commented. I include them below, trying to limit my point of view to that of a juror. I'll review the eyewitness testimony in segments. Olague revealed that about 2:15 a.m. on February 27, 1979, he and Fierro were together in front of the El Paso Public Library. Well that sounds innocent enough. However, public libraries are typically not open at 2:15 in the morning. I presume, therefore, the two of them weren't actually interested in literature. I presume also that it wasn't merely coincidental the two of them were there at the same time. Assuming Olague is telling the truth, I would like to know what the two of them had been doing together before and what the two of them planned to do after. Olague hailed a taxicab to go home. ... Fierro told Olague that after Olague was taken home he would go to his home in Juarez. Really? How exactly would Fierro go to his home in Juarez? Do they have some sort of international cab service in El Paso? Can the cab carry paying passengers from El Paso to Juarez? Was Fierro planning on taking the cab to the border, walking across the border, then picking up another cab to take him to Juarez? Olague got in the front seat and Fierro got in the back seat. Really? That seems unusual as well. Convenient for Olague, but unusual nonetheless. Olague requested Castanon to take him to 226 Wooldridge where he lived. As they neared the location Olague heard Fierro yell "stop" and as Castanon turned Fierro shot him in the back of the head. As The Doormouse indicated, it seems hard to shoot someone in the back of the head if they are turning to look at you. The bullet wound, though, was behind the right ear. A juror might conclude that the cab driver was turning his head to the right when Fierro fired. Alternatively, a juror might conclude that the cab driver was looking straight ahead when a passenger in the front seat shot him behind the right ear. In either case, it makes absolutely no sense for Fierro to instruct the driver to stop, then shoot him without giving him an opportunity to stop. That left no one to drive the car. Not to worry though. Olague was conveniently sitting in the front seat, and Olague responded brilliantly to the surprise shooting, just as Fierro must have known he would. Stay tuned. Castanon fell into Olague's lap leaving blood on Olague's pants. The taxicab jumped the curb and ran into a yard, but Olague hit the brake and the engine died. Fierro drove to Modesto Gomez Park. Fierro removed Castanon from the cab and dragged him some distance and then shot Castanon again, and took Castanon's wallet and watch and jacket. Olague stated Fierro used the jacket to wipe up some blood and threw the jacket out along the road they took to Juarez. Whoa! That seems foolish. You have just shot a cab driver in the head and dumped his body and disposed of a bloody jacket. Still, you have a stolen cab with blood on the seats and you have the murder weapon. You have a passenger with blood on his pants. What one should do at this point is avoid law enforcement officers. I wouldn't expect that one would voluntarily drive a border checkpoint where heavily-armed, extremely-skeptical, law enforcement officers are almost certain to examine your car and ask you pointed questions. The taxicab which Castanon had been driving was discovered across the international border in Juarez, Mexico, with bloodstains on the front seat and carpet. His jacket was discovered on the grounds of Bowie High School on a road leading from Modesto Gomez Park to Juarez. I don't know whether or not any of the jurors knew where Bowie High School was in relation to Modesto Gomez Park, but if any of them did they should have realized that specific claim was hogwash. I offer below a map of the area courtesy of my good friends at Google. Bowie High School is not on a road leading from Modesto Gomez Park to Juarez. It may seem like a minor point, but it cautions me that the State is willing to misrepresent the evidence even if nothing much is at stake. If I don't trust the State to tell me the truth, they are going to have one hell of a time convincing me beyond a reasonable doubt that the defendant is guilty. He said Fierro had taken a silver watch from Castanon; the watch was never found. He said he and Fierro had sold the murder weapon to a rancher south of Juarez, but neither the rancher nor the gun was ever located. More interesting is Olague's bloody pair of pants. He told the police that he could lead them to the pants. The police never took him up on his offer. I don't know if the jury was aware of that issue. [Olague] testified that he and Fierro had been committing robberies together for six or seven months. ... He said that he had committed more than forty burglaries and that the police were aware of them, but that he had been charged with only one offense. During one bizarre moment ... he accused a member of the jury of having purchased as stolen CB radio from him. He said that he had committed more than forty burglaries and that the police were aware of them, but that he had been charged with only one offense. There is not a single portion of Olague's story that was corroborated. There was not a single portion of his story that made sense. More significantly, Olague demonstrated for the jurors that he would, on a whim, falsely accuse someone of a crime. He claimed one of the jurors fenced a stolen CB radio for him. For some reason, the police did not arrest the juror. Not even the police believed Olague was telling the truth. The commentors were less compelling in their explanation for rejecting Fierro's confession. Imagine if you were born and raised in Texas then called to sit on the jury of The People of Texas versus Cesar Fierro. You would be sitting in the jury box wearing a cowboy hat and cowboy boots while a Texas Ranger swore under oath that they did nothing to extort a confession from the defendant. [I've embellished just a bit.] On the other hand, you have the defendant, who was clearly far from an upstanding citizen, telling you an unlikely story of his parents being beaten and threatened with a cattle prod by the Mexican police to help the El Paso police extract a confession. Such a claim is easy to make but difficult to prove. How could you decide who was telling the truth? Why would you take the word of low-life who had nothing to lose by lying over the word of several sworn police officers who could lose their job and be jailed for perjuring themselves? As a skeptical juror, I would not have had to wrestle with such a conundrum. I would have rejected the confession simply because it wasn't recorded. If the police had simply recorded the interrogation and the confession, then there would be no question about what happened. Instead, the police choose to not record the interrogation and confession. As a skeptical juror, I would have deemed the failure to record as destruction of evidence. If the police destroyed the results of DNA testing and then told me the DNA matched the defendant, I would simply refuse to accept the claim. I would be suspicious of the police behavior, but I would not have to conclude they were liars. If the evidence is not properly preserved, it is untrustworthy. I will not use untrustworthy evidence to send a man to prison, much less to the needle. The opposite of a skeptical juror is a compliant juror. We'll talk about compliant jurors in the next post. As a juror though some of those things wouldn't concern me at first glance like you. Shooting a cab driver isn't the smartest thing in in the first place so assuming everything else will be smart is a bad assumption too. Looking at the map it looks okay for them to have shot the cab driver and then take off in one direction of the road, go a little bit and decide to dump some of the stuff and then decide to go to Mexico. And going to Mexico and even facing the border guards going south would be a dumb but somewhat of a reasonable decision because getting out of the country is an okay decision. 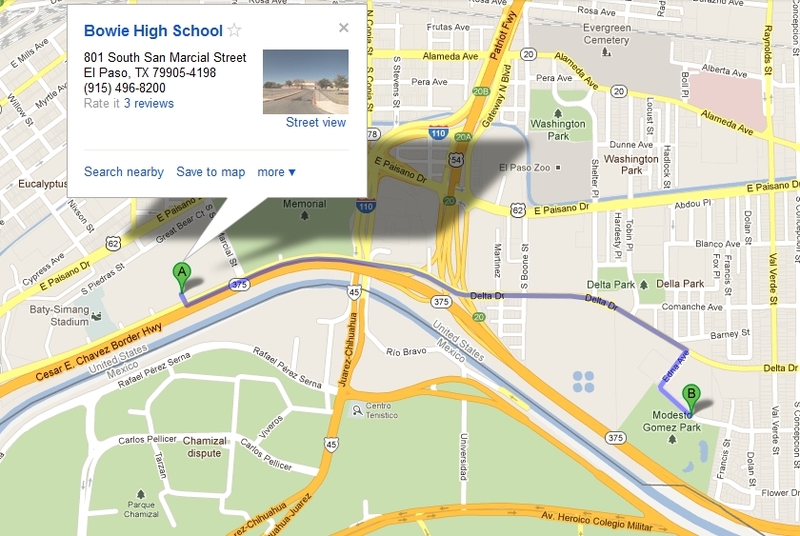 Would it have bothered you if the State told you the high school was along the path from the park to the border when it was not? Would that have been a small enough lie on the part of the State not to fault them for it? Would that have caused you to wonder about what else they might be lying to you about? Would it have bothered you if the State's star witness identified a fellow juror as someone who had purchased stolen goods from him? Would it have bothered you that the State knew their witness committed many crimes but favored him by charging him with only one? You say it comes down to belief of one side over the other, but that is incorrect. If it were as you describe, a defendent who put on no defense would always be found guilty. The State must prove guilt beyond a reasonable doubt. It is not a question of whether their eyewitness was slightly more believable than the defendant. Their eyewitness must be credible beyond a reasonable doubt, or the testimony of that eyewitness should be rejected. Perhaps you would find an eyewitness such as Olague sufficiently believable to condemn a man to prison or death. I would not. I agree with you that there were big holes in this case and from the limited amount of information we had I would say he wasn't guilty. I was arguing with some of your smaller points and I wouldn't think they were important but the issues you brought up here would be more important. I wouldn't have taken anything that Olague said seriously until he proved that he could be trusted and I don't see anything that would show he was, but the jury believed him over the defense side. This case probably didn't get much press conference to ask the jurors what made them decide. Some of the concerns you brought up were probably introduced in trial, but when you get a summary you don't know. Fair enough. Such is the nature of a deliberation. About his confession, in evaluating its validity, doesn't the fact that his statement contains a declaration that his parents are innocent set alarm bells off in your head? It seems to be coming out of left field for no reason unless Fiero was concerned about his parent's fate with the police in Mexico which supports the claim the confession was coerced. - "Fierro then inquired if his mother was in custody and insisted she had nothing to do with the murder"
- "To satisfy Fierro, Medrano called Lt. Palacios and handed the phone to Fierro." - "He [Medrano] stated Fierro was given a cup of coffee and a pack of cigarettes..."
The defense admits that Fierro ASKED about his mother and further acknowledges that they actually CALLED Lt. Palacios (so that Fierro could find out about his parents). So Fierro was definitely worried about his parents during the initial interrogation (or he was play-acting -- unlikely). That obviously isn't enough to show that Fierro was abused during the confession, or that his parents were actually threatened, but Fierro had to get the idea from somewhere, no? And at the end of the day, the truth of Fierro's "confession" is more likely to depend on what Fierro THOUGHT was happening with his parents than what actually WAS. Oh... and a whole pack of cigarettes? Seriously? Good points also. Still, there is no reason any of us should be reading tea leaves regarding the confession. The police could have recorded the confession but chose not to. As far as I'm concern, they failed to preserve critical evidence. I will not fault the defendant for such a careless (and probably intentional) failure on the part of the State. What is so sad is that this man has now became one of the many who end up losing their minds after years in a death row cell alone. What makes it even more sad (to me anyway) is considering someone being driven to insanity and smearing feces on themselves and on their mail to draw butterflies, etc in a death row cell for a crime they DIDNT do. From what I have heard from reliable information, the poor guy has mentally deteriorated over time and that truly is just heartbreaking.